I heard about it recommended on one of those NPR programs just before Christmas–the best of the best books of the year. Only, this book was published in 1983. Adler was a staff writer for The New Yorker for 40 years or so–and comes with an impressive list of credentials (Bryn Mawr, Harvard, the Sorbonne, Law degree from Yale and an honorary doctoral law degree from Georgetown) and of fiction and nonfiction books. 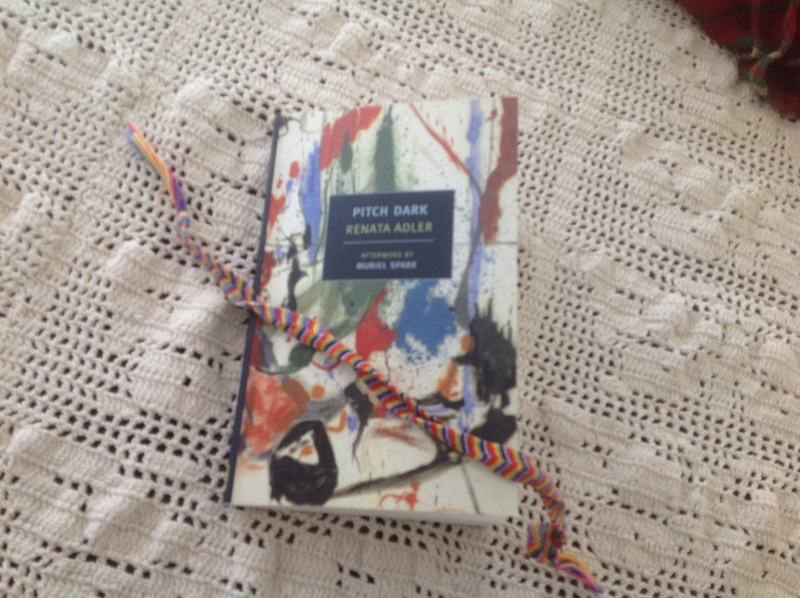 The recommender said he had recently reread Pitch Dark and thought it a classic in some way. The book is very modern, very spare–and is written in a kind of stream of consciousness where it takes the reader a few pages to figure out what’s going on–a love affair with a married man. He knew that she had left him when she began to smoke again….Years ago, he had smoked, but not when they met. So she stopped, as people do when they are in love Take up cigarettes, or give them up, or change brands. As people do to be at one at least in this. Long after that, she began to smoke again (8). You can rely too much, my love, on the unspoken things. And the wry smile. I have that smile myself, and I’ve learned the silence, too, over the years. Along with the expressions, like No notion and Of necessity. What happens though, when it is all unsaid, is that you wake up one morning, no, it’s more like late one afternoon, and it’s not just unsaid, it’s gone. That’s all. Just gone. I remember this word, that look, that small inflection, after all this time. I used to hold them, trust them, read them like a rune. Like a sign that there was a house, a billet, a civilization where we were. I look back and I think I was just there all alone. Collecting wisps and signs. Like a spinster who did know a young man once and who imagines ever since that she lost a fiancé in the war Or an old fellow who, having spent months long ago in uniform at some dreary outpost no where near any country where there was a front, remembers buddies he never had, dying beside him in battles he was never in (9). Sometimes he loved her, sometimes he was just amused and touched by the degree to which she loved him. Sometimes he was bored by her love and felt it as a burden. Sometimes his sense of himself was enhanced, sometimes diminished by it. But he had come to take the extent of her love as given, and, as such, he lost interest in it. She may have given him this certainty too early, and not just out of genuine attachment. One falls out of gradations of love and despair after all, every few days, or months, or minutes. With courtesy, then, and also for the sake, for the sake of the long rhythms, she kept the façade in place and steady, unaffected by every nuance of caring and not caring. He distrusted her sometimes, but on the wrong grounds. He thought of her as light with the truth, and lawless. And she, who was not in other ways dishonest, who was in fact honorable in his ways and in others, was perhaps dishonest in this: that not to risk losing him, or for whatever other reason, she concealed, no, she did not insist that he see, certain important facets of her nature. She pretended, though with her particular form of nervous energy she was not always able to pretend this, that she was more content than she was, that her love for him was more constant than, within the limits that he set, it could be (12). « Turkey Tracks: The Best Cup of Coffee Ever!